UC Irvine’s 2012 Homecoming celebration culminated as over 4,000 sports fans watched the UC Irvine men’s basketball team defeat UC Riverside at the Bren Events Center. In the hours preceding the game, fans, students and alumni participated in the Homecoming Street Festival . 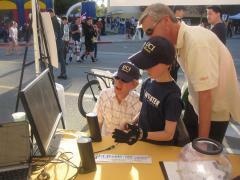 The Festival featured live entertainment, food trucks, a kid zone and booths from various schools at UC Irvine. The Henry Samueli School of Engineering booth highlighted three research projects. The first was the transcatheter aortic valve research known as FOLDAVALVE from the lab of Assistant Professor Arash Kheradvar, M.D., Ph.D., The Edwards Lifesciences Center for Advanced Cardiovascular Technology in the Department of Biomedical Engineering (BME). Ahmad Falahatpisheh and Hamed Alavi, graduate students in Kheradvar’s lab, displayed a poster illustrating the technology and its benefits. FOLDAVALVE is a self-expandable percutaneous aortic valve that is smaller than the current valve technology, thus making it easier to be inserted and less invasive. Once properly placed, the valve can be expanded to its full size for normal function. Professor David J. Reinkensmeyer, Ph.D., Department of Mechanical and Aerospace Engineering, displayed two projects. Danny Zondervan, a graduate student in his lab, presented a low-cost rehabilitation device known as the Resonating Arm Exerciser (RAE) for stroke patients in developing countries, which will allow those with fewer resources to receive rehabilitation treatment following a neurological injury. RAE attempts to emulate the "patient active" assisted therapy achieved with robotic therapy by employing the principles of resonance to amplify a patient's arm movements. RAE can attach to any standard wheelchair, reversibly converting it into an exercise device. Many stroke patients are confined to wheelchairs, and several low-cost wheelchairs are already available in developing countries, so this design allows wheelchair users to dual-purpose their chair and participate in effective therapy. The third project, the MusicGlove, assists stroke patients in regaining function in their fingers. Visitors to the Samueli School booth were able to try on the glove and play a game inspired by Guitar Hero II, which was created by Chris Canfield, alum of the School of Social Sciences at UC Irvine, simply by touching their fingers together. The goal of the project is to create a fun game for rehabilitation patients, encouraging them to view their rehab as less of a chore.